Her married name became Pelham. Sir William Jones married Elizabeth Aleyn, daughter of Edmund Aleyn and Mary Miller. Henry Clinton, 7th Earl of Lincoln was born in 1684.3 He was the son of Francis Clinton, 6th Earl of Lincoln and Susanna Penyston.4 He married Hon. 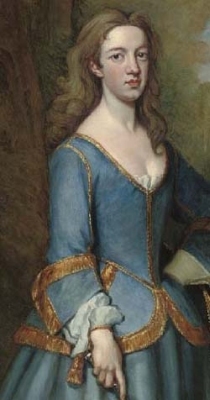 Lucy Pelham, daughter of Thomas Pelham, 1st Baron Pelham of Laughton and Lady Grace Holles, on 16 May 1717.1 He died on 7 September 1728. [S6] G.E. Cokayne; with Vicary Gibbs, H.A. Doubleday, Geoffrey H. White, Duncan Warrand and Lord Howard de Walden, editors, The Complete Peerage of England, Scotland, Ireland, Great Britain and the United Kingdom, Extant, Extinct or Dormant, new ed., 13 volumes in 14 (1910-1959; reprint in 6 volumes, Gloucester, U.K.: Alan Sutton Publishing, 2000), volume VII, page 699. Hereinafter cited as The Complete Peerage. After her marriage, Hon. Lucy Pelham was styled as Countess of Lincoln on 16 May 1717. From 16 May 1717, her married name became Clinton. [S11] Alison Weir, Britain's Royal Families: The Complete Genealogy (London, U.K.: The Bodley Head, 1999), page 154. Hereinafter cited as Britain's Royal Families. [S11] Alison Weir, Britain's Royal Families, page 155. [S6] G.E. Cokayne; with Vicary Gibbs, H.A. Doubleday, Geoffrey H. White, Duncan Warrand and Lord Howard de Walden, editors, The Complete Peerage of England, Scotland, Ireland, Great Britain and the United Kingdom, Extant, Extinct or Dormant, new ed., 13 volumes in 14 (1910-1959; reprint in 6 volumes, Gloucester, U.K.: Alan Sutton Publishing, 2000), volume XII/2, page 704. Hereinafter cited as The Complete Peerage. [S21] L. G. Pine, The New Extinct Peerage 1884-1971: Containing Extinct, Abeyant, Dormant and Suspended Peerages With Genealogies and Arms (London, U.K.: Heraldry Today, 1972), page 15. Hereinafter cited as The New Extinct Peerage. From before 15 June 1541, her married name became Clinton. [S6] G.E. Cokayne; with Vicary Gibbs, H.A. Doubleday, Geoffrey H. White, Duncan Warrand and Lord Howard de Walden, editors, The Complete Peerage of England, Scotland, Ireland, Great Britain and the United Kingdom, Extant, Extinct or Dormant, new ed., 13 volumes in 14 (1910-1959; reprint in 6 volumes, Gloucester, U.K.: Alan Sutton Publishing, 2000), volume III, page 127. Hereinafter cited as The Complete Peerage. [S6] Cokayne, and others, The Complete Peerage, volume III, page 126. Her married name became Stourton.1 After her marriage, Elizabeth Dudley was styled as Baroness Stourton on 13 December 1535.